Dale McCarthy anticipated her family’s planned February vacation to Grand Cayman would be expensive. Hotel rates are at a premium during school breaks. Ditto airfare. But McCarthy still experienced sticker shock when the Westin Grand Cayman Seven Mile Beach Resort & Spa informed her there would be a $150-per-night fee to guarantee connecting rooms. The family of four typically gets two separate sleeping areas at an activity-packed resort to accommodate their son who has special needs. “I was totally surprised. It’s not like we don’t travel. We’ve been to plenty of other hotels, and I’ve never gotten hit with this charge,” she said. Many industry experts said they hadn’t heard of connecting room fees before, but they agreed that hotels are tacking on fees at a heightened pace for everything from restocking the minibar to having the bellman hold your baggage. The increase is a combination of more fees and higher amounts charged, the trend report stated. McCarthy, who called the hotel to discuss the fee after booking the rooms through a travel agent, said a front desk staffer explained that the exorbitant fee insures that these rooms are taken out of inventory, a requirement because of the limited number of connecting rooms, the period of high demand for the rooms, and to make up for potential loss of income should, for example, someone else contact the hotel three days prior to the reserved stay and want the rooms for longer. Repeated e-mails to the Westin Grand Cayman could prompt no explanation for the fee. Perrin said $150 is as steep a surcharge as she’s seen. 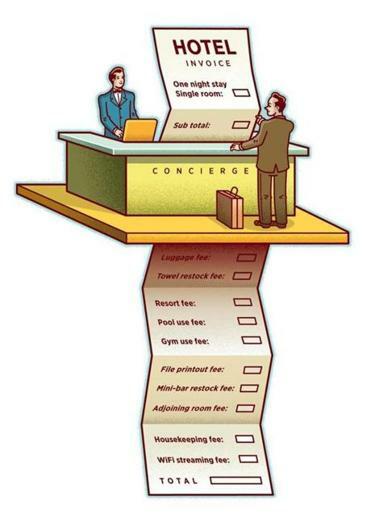 The increasingly common “resort fee” many hotels charge is $20-$30 a day. Susan Peavey, whose eponymous travel agency has outposts in Harwich, Marshfield, and Randolph, doesn’t think hotel fees have become as rampant as airline charges, but has noticed an uptick in hidden fees in certain destinations such as Las Vegas, Hawaii, and New York. Hank Phillippi Ryan knows about the Las Vegas fees first-hand. Last year, the mystery author stayed at the Paris Hotel and Casino while attending the American Library Association’s annual conference. After a fruitless search in the hotel lobby for a computer to print her airline boarding pass, she found a kiosk requiring $7.95. Phillippi Ryan, an investigative reporter for WHDH-TV, theorized that hotels charge the fee because most guests will pay it without grousing. Regardless of whether it’s a taxi company or hotel, Phillippi Ryan said all the fees leave her with a bad feeling about the experience. She said she has recently started to see printed envelopes in hotel rooms suggesting guests tip. “When the hotel demands you say thank you, it’s less pleasant. It seems like an institutionalized thank you,” she said. But Christina Gambini, vice president of hotel programs for Tzell Travel Group, said hotel surcharges aren’t about manners. They are simply new revenue sources in an industry that is constantly adapting. She cited the loss of income in recent years from unused landline telephones in hotel rooms as one example of a motivating factor for new (or newly noticed) charges. Experts said fighting the fees works on occasion, and Peavey said booking through a travel agent gives guests an extra voice in the argument. While she said she has personally never encountered a hotel that guarantees connecting rooms, she does take a proactive approach, calling the destination a week in advance of the stay to push the accommodation through. Joe Viger of North Conway, N.H., said anyone can usually negotiate a reduced — or eliminated — fee if they have the time and energy to devote to the process. He flew 30,000 miles and stayed in dozens of hotels last year for his job in software sales. He said his extensive travels have helped him form strategies for gaining the upper hand on certain surcharges. He always fights resort fees and he prefers to speak with female customer service representatives who, he said, are more willing to compromise.